A pocket knife is a foldable knife with one or more blades that fit inside the handle that can still fit in a pocket. It is also known as a jackknife or a penknife or sometimes referred to as a folding knife. Everyone acquired a pocket knife at some point in his/her life. Whether your pocket knife was a gift from your grandfather or you got it while working on your first badge as a Cub Scout, no doubt, it’s a trusty tool that you use for your daily little tasks. 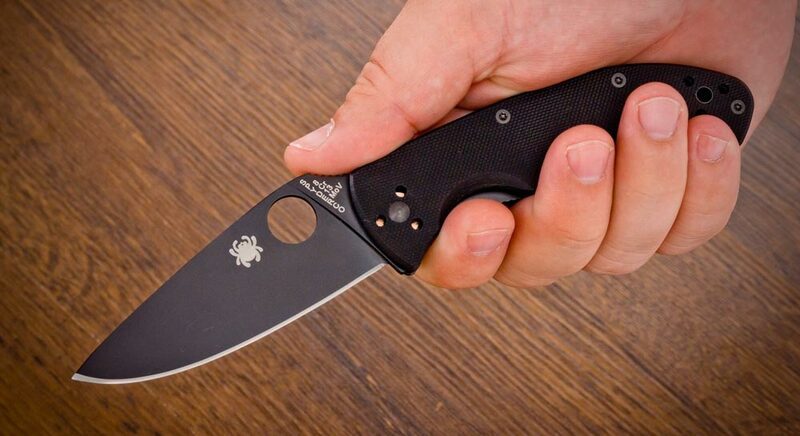 This small folding knife has become an ultimate tool in everyday life. Here’s a bit of the history about this traditional knife. Archaeologists have discovered the origin of the oldest pocket knife known to mankind to the remote village of Hallstatt, Austria. Researchers are not sure about the original creator of this knife but believe, it belongs all the way back to the early Bronze Ages, approximately 400-500 BC. This knife contains a bone handle which was common among tools at this time. Hallstatt was a Celtic village in Austria, that was predominantly known for the world’s oldest known salt mine that belongs all the way back to the time before written history. It is highly believed that this bone handle pocket knife was first used by one of the mine workers for the various tasks during his job. An everyday carry (EDC) pocket knife can be used for various tasks. Some people use pocket knife to open items, cut ropes, and prepare fruits. Some people use it as a hunting knife or for skinning their game. Others use it for self-defense, sharpening pencils, and cutting seat belts too. Seriously, an EDC pocket knife can be used for a lot of things. Let’s discuss some of the important ones. Some hunters use pocket knife for dressing their game because we all know pocket knife can be a foldable knife so it’s really easy to carry it along, as it does not require a large space in a backpack. We all know that eating a sliced fruit is so much more satisfying than taking bites like a savage. So if you are away from home and got some fruit to eat, just take out this folding knife from pocket, slice the fruit and eat it. Plastic tags on new clothes are annoying for everyone. It wouldn’t be so bad if there weren’t a dozen of those things deeply embedded in the clothing. A pocket knife makes quick work of these annoying tags. If you are on a party and don’t find any bottle opener. Just take out your pocket knife, a blade or handle scales can be used to pop the top off a beer bottle. If you got a situation and don’t find a dedicated wirecutter. Again, you can use a pocket knife to get a job done quickly and easily. We all know ropes are everywhere, from homes and schools to job sites, also when you are out on camping, you need to cut a rope to tie or untie a camp. A good pocket knife can easily get your job done. Definitely, a knife can be used as a weapon according to the situation. Unfortunately, one of the greatest risks to anyone’s personal safety nowadays is other people. So, if you got in a situation and need to defend yourself, you can use a pocket knife for self-defense too. Because it’s always better to be able to defend yourself than not. 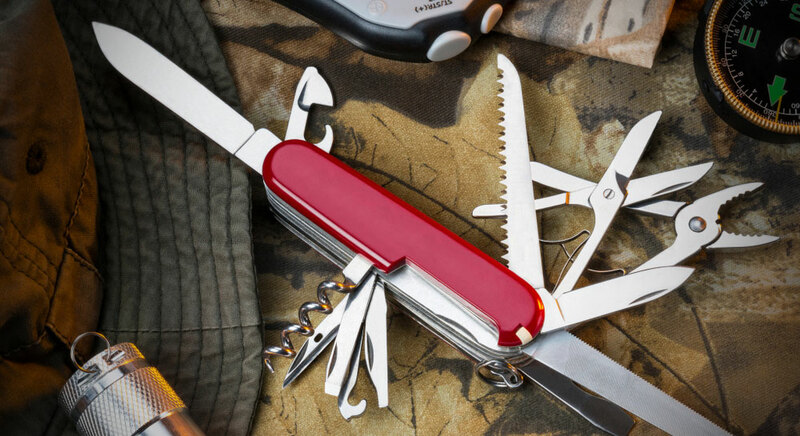 Other than dressing a deer, if you are out on fishing, you can also use a pocket knife for gutting a fish. Pruning helps to shape and improve the health of plants. When you’re gardening in a backyard, you can use a pocket knife as a makeshift pruner. Some pocket knives, especially the multi-tools, come with dedicated can openers, but you can also open a can with a standard pocket knife. Just be careful not to mess up the blade. So these were some of the common uses of a pocket knife. You can also use pocket knives for a variety of other tasks too. But we are not here to discuss only the uses of pocket knives. Now let’s discuss some other important stuff…..
We all know that there are tremendous amount of pocket knives available in the market. So, which one is the best pocket knife among all.? There is not a single answer to this question, because pocket knives have so many uses as we have discussed above, some pocket knives are general purpose but some are manufactured for special purposes. There are clip-point blades, drop-point blades, tanto blades, stainless-steel blades, and carbon-steel blades, also serrated blades and non-serrated blades. So there is a lot of confusion which one to buy. 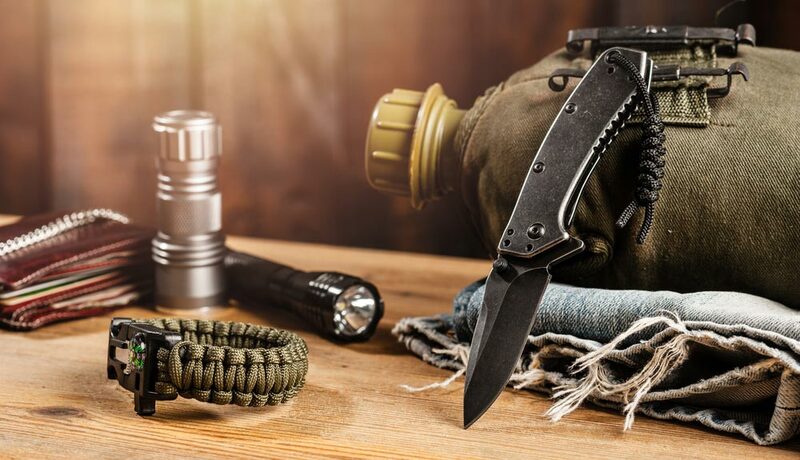 Here at knifemetrics, we are discussing in detail what things you need to look in your pocket knife and which pocket knife best suits your needs. So, let’s dive into detail…. Pocket knives come with different blade sizes ranging from 2-inches to 7.5 inches blade length. Of course, the functions of 2-inches blade is different from 7.5-inches blade. So here are going to discuss blade size in three stages. The most important point of a small blade pocket knife is that it is legal. According to knife laws, length of knife’s blade below 2.75 inches is safe, so having one of these smaller knives will ensure you’re compliant with almost all knife laws. Definitely, these small blade pocket knives are not for heavy use. You can perform small tasks in a home with these knives like cutting a rope, opening a can or slicing fruit. Another benefit of having a small blade pocket knife is that you can easily carry it in your pocket due to its small size. These medium-size pocket knives are the most popular ones. Because you can perform a variety of tasks with them from skinning an animal to cutting a rope. These knives are the best ones because they can perform almost all tasks of small and large blade pocket knives too. These large pocket knives of having blade length over 4-inches are manufactured for heavy tasks. Some large pocket knives are as useful as some fixed blade knives are. Because pocket knives are much easier to carry than fixed blade knives. You can not carry a large pocket knife for your everyday use due to their large size and heavyweight. Some local laws of the states also declared it illegal to have a large pocket knife. Single blade pocket knives are very famous due to their best quality and simplicity. This type of knives only focus on the single blade design, so it has a better locking mechanism than multiple blades. Single blade pocket knives have faster opening mechanism too. The only disadvantage of a single blade is lack of variety, these knives are perfect as a general all-purpose knife, but there are certain tasks that you cannot perform like whittling, due to the single blade. Having more than one blade in your pocket knife means you can perform tasks of more than one knife with your single pocket knife. These knives may have up to four blades. You never know when you’ll need to skin a fur-bearing animal in one instance and carve a piece of wood in the next. You can perform a wide variety of tasks with multiple blades, but this knife is not as strong as a single blade pocket knife. So you cannot perform heavy tasks with this knife. The other disadvantage is that it’s a bit heavy due to multiple blades, so you may feel a bit annoying to carry it. When we talk about the best pocket knife, many people think of a plain edge knife. In the past, plain edge pocket knives are the only type of knives. But nowadays, knives having serrated edges are also very popular. Because you can perform some tasks much better with a serrated edge rather than a plain edge pocket knife. There is another type of pocket knife whose edge is partially plain and partially serrated, these types of pocket knives are called partially serrated pocket knives. Now the question is which one is best for you….?? Lets this discuss this in detail. These type of pocket knives have a continuous edge that makes them the most versatile and comes with a wide variety of blade shapes to best make the use of a straight edge. Their most useful application is what most of us think of when we think of using a best pocket knife: a strong, steady pressure. The main advantage of a straight edge pocket knife is that it gives you a very smooth cut, as opposed to serrated knives which may tear food. It is great for dicing, slicing, mincing, and chopping. Another great advantage of plain edge pocket knives is that these knives are much easier to maintain since the unbroken edge is easier to sharpen or reprofile. Serrated edges are teeth-like edges ground into a knife’s blade, creating a long series of small edges. If you’ve ever used a saw or bread knife, then you might have seen them before. They’re great for food with a harder exterior and a soft interior, like tomatoes and bread. These type of pocket knives can easily cause tearing but does not cut as cleanly as a plain edge pocket knife. Another drawback of serrated edges is maintenance. These knives have a lot of small edges so it requires a lot of work to sharpen all of them when edges become dull. So you have to go for a specific type of pocket knife sharpener to sharpen their serrated edges. Partially serrated edge contain half serrated edge and half plain edge. And these type of pocket knives are more popular than serrated edge pocket knives. You can use the plain edge of this pocket knife for normal use and the other part for rigorous cutting. The only disadvantage of this knife is maintenance due to its serrated edge. Therefore, if you’re looking for the best of both worlds, we highly recommend you a partially serrated edge is a best pocket knife for you. The price is another important factor that you always keep in your mind while purchasing anything. If you have a tight budget, we recommend you to buy a pocket knife under $100. If you can afford, you should try to buy a best pocket knife because high-quality pocket knives perform much better. There are different styles of blades especially when it comes to pocket knives. Whether you are going to buy a single blade or multiple blades pocket knife, you should need to consider blade’s style too depending upon your needs. So let’s discuss these styles…. Clip-point blades are great for everyday needs, but can also be used as a hunting knife. Clip points are better for piercing and deep belly makes it optimal for slicing. Drop-point blades are usually found on survival or hunting knives, sometimes on some larger models of Swiss Army knives. The thin point is great for piercing different objects, but it’s very vulnerable and can break pretty easily due to its point edge. Needle points are not very common on folding knives, but they can be found on certain knives. Other than piercing, it’s not good for much but it can be a great asset for self-defense. Handle material of a pocket knife is another important factor because it ensures your grip stays tight on the pocket knife. Each material has its own specialty in terms of performance and comfort, but it can also be a matter of personal preferences that dictate what you decide on. Aluminum is frequently used in newer knives and its lightweight too. It provides you an excellent grip and is especially suitable for those pocket knives that will be used in harsh weather conditions. Stag handles, which are made from the antlers of deer, have naturally fallen off, have a rough texture that allows for a stronger grip. But pocket knives having stag handles comes with high price. Titanium handles are highly corrosion resistant, durable and lightweight. These are usually found on newer pocket knives, but despite their strength and performance, these handles are sometimes considered as cold and impersonal. Celluloid is known for its ability to morph into any color of the rainbow. It can also be fabricated to resemble almost all natural materials like ivory, horn, stag, pearl, wood, amber, etc. Bone is another type of popular pocket knife handle and comes with different varieties like jigged bone(also called stage), giraffe bone, smooth white bone and scored bone. Some pocket knives have wood handles too. Woods that are commonly used for knife handles are bubinga, rosewood, blackwood, box, elder, curly maple, koa, snakewood, and thuyas. Stainless steel handles are corrosion-resistant and very durable but a bit heavier and has a lower threshold to withstand tension than other metals like titanium. 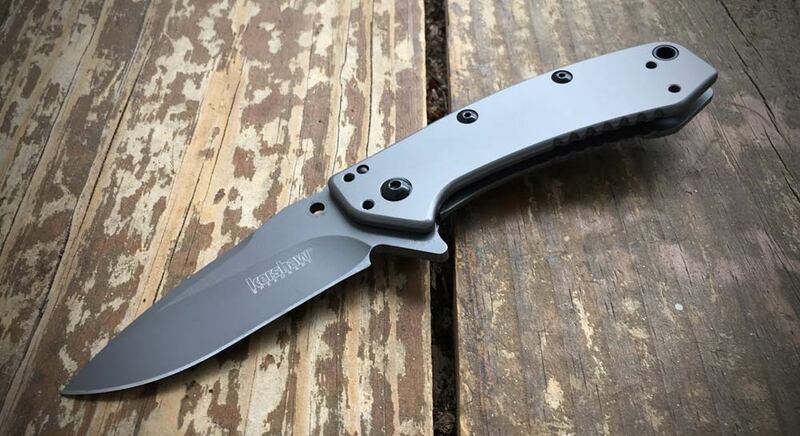 The Kershaw Blur Folding Knife is one of the most popular pocket knife that is available in the market today, and also the best EDC knife for the money. Kershaw brand is always known for high quality, but this pocket knife is also very budget friendly, while not ignoring quality. The blade flies out super fast! The grip has the right amount of traction on it as well. The knife arrived extremely sharp! The blade closes smoothly and it sits perfectly centered in the handle when closed. The blade retention is very good as well! Lock up on the blade is really solid with the liner lock, and thumb studs work great for deploying the blade out. You cannot wiggle the open knife because the fit is so good. The blade is the perfect weight and width to carry around. You will really enjoy carrying this knife in your dress slacks. Buck Knives has been around a very long time. And they are manufacturing high-quality knives. This is the perfect pocket knife. It’s small enough to fit in a ‘watch pocket’ in your jeans. It’s handy enough to use for most around the house tasks. It has a lock-back blade for safety and holds a very sharp blade. You can use this folding knife as your everyday knife. Maybe you don’t find it as “stylish” as other best pocket knives in the market today but it is tried and tested and has been around for a long time. It’s easy to sharpen to a razor edge by any best pocket knife sharpener and is a very good steel choice for a knife like this. The deep hollow grind is a signature for Buck’s hunting knives, which aids in getting the cutting edge so sharp. In addition, the quality of the handle materials, fit and finish is over and above what you would expect to get from a knife with this price tag. Add in Buck’s outstanding lifetime warranty and you have a serious winner of a knife. 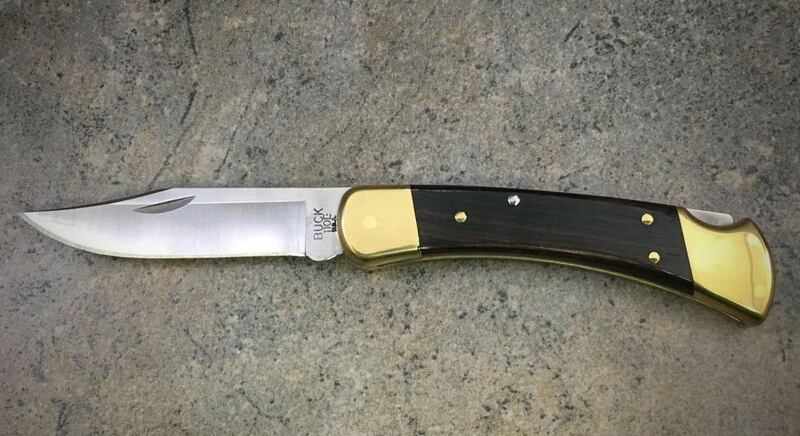 This is a fantastic pocket knife that is made in the USA. 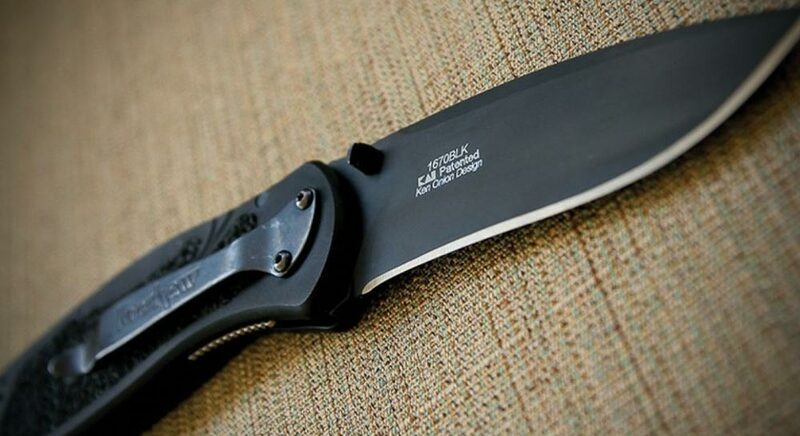 You can use this folding knife for almost every purpose. It’s a bit costly knife because it comes with CPM-S30V steel. And we all know it’s very expensive steel. The benefit of CPM-S30V steel is that it sharpens easily and retain an edge for a long time. And It’s also one of the toughest steels to break and cuts for everyday use. The blade literally cuts through everything like butter. The handle is very comfortable. You can hold this knife well in multiple positions. The forefinger groove needs to be bigger for sure though. The blade locks in place and pivot bushing system makes this pocket knife very easy to open and close. This Kershaw 155TI Cryo SpeedSafe Folding knife is a fantastic knife. It comes very sharp and holds the sharp edge fairly well. It is appropriately sized to conceal or carry in your pocket, whatever verbiage you want to use. We highly recommend you to check your local laws if you are unsure. It will prevent you from going to jail and that is a great thing. You can carry this Kershaw Pocket knife every day. Its size is nearly perfect. It’s not too large to fit your pocket and it’s not too small to be used hard with confidence. There is a nice clip that holds it to your pocket if you want to carry it that way. It opens with one hand easily and is able to be closed one handed if you are careful. It has a locking frame which holds the blade very stable for use. The ease and speed of use make it a go-to knife. 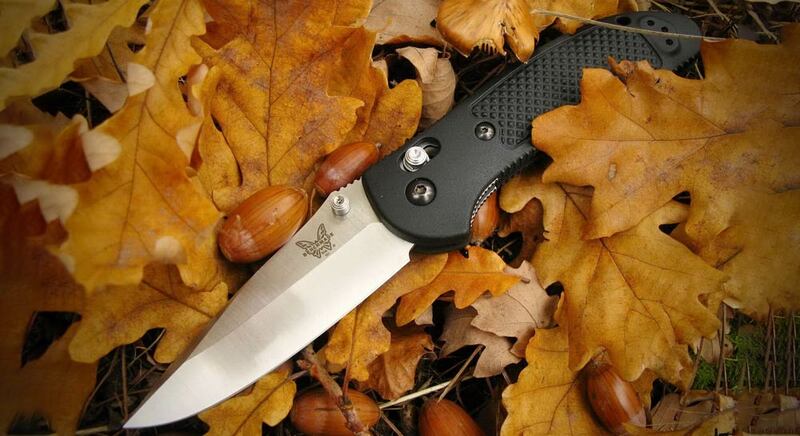 You’ll love this folding knife. The finish is nice and well worth the price you pay for it. Our experts believe that there is no knife of this high quality in this price range. Although the knife’s blade is manufactured in China, its strength and quality are really high. Perfect minimalist combo pocket knife. It has two blades that are easy to sharpen, a Phillips and two regular screwdriver blades, tweezers and a toothpick which are all frequently useful. The can opener, bottle cap lifter and awl have become less useful as technology is quickly moving to containers that do not require separate opener tools. You can get a lot of work done with this knife without heading to the toolbox. You can use it for field dressing, cutting down cardboard boxes at work, making tinder for starting campfires and other routine tasks. The pointy awl is nice for digging crud out of tight places when you don’t want to wreck your blade. This is your Swiss Army knife if you don’t want a corkscrew or scissors. Perfect for everyday carry, you’d don’t even notice it in your pocket. Once you start carrying a tool like this you’ll wonder how you ever got along without one…it’s indispensable. The best gift you could give any mechanic, tradesman or hobbyist. This knife is very close to the perfect weight and size for an EDC pocket knife because it is balanced impeccably. The blade shape and length works really well for everything from opening packages to cutting cheese and sausage by the lake. The axis lock is smooth and easy to open and close when used left handed. 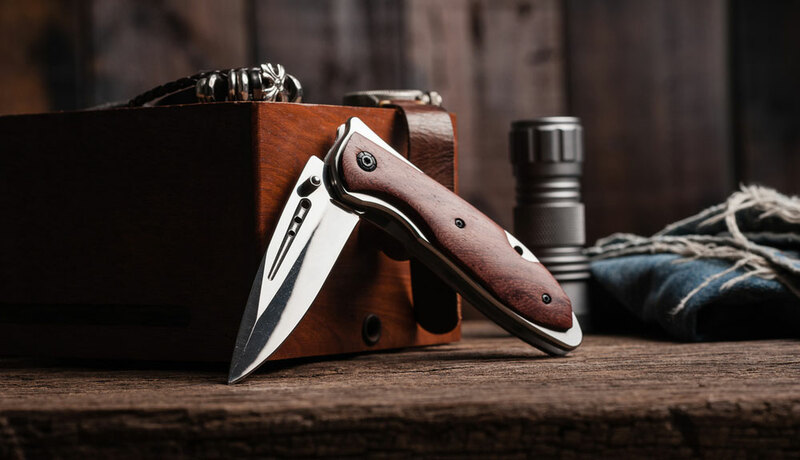 The ability to adjust to pocket clip to left hand carry make a big difference to include this amazing pocket knife in this list. It’s made in Oregon, USA by American Manufacturers and is well worth the extra cost to buy a modern-day American Classic. This knife is a heritage of modern craftsmanship that you could pass down for generations. Benchmade also offers lifetime sharpness guarantees so if the blade ever becomes dull you just ship it to them and they’ll re-hone the factory sharpness and grind absolutely free every time. Also, their customer service is so fantastic and accommodating that you could come to them with any knife issue be it a lost clip, a broken knife, etc and you know you’ll get your issue resolved professionally and timely. 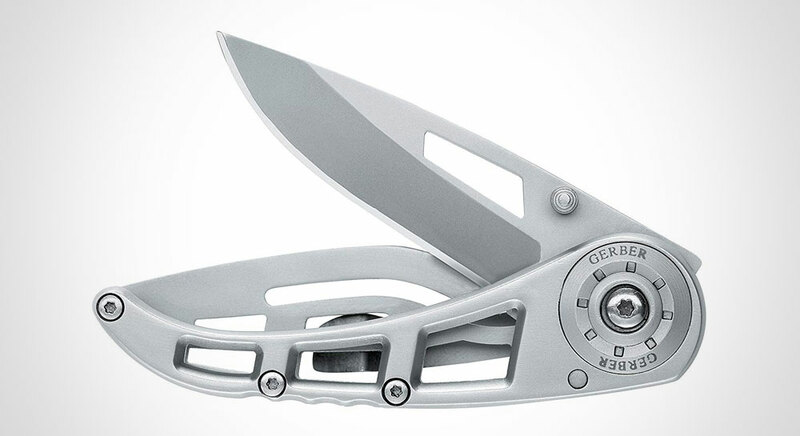 This Gerber pocket knife is fantastic. It’s made of beautiful stainless steel and the screws are of high quality. Even though it’s small, the knife is comfortable to hold and use. The locking system hasn’t had any issues at all. This knife is sturdy and the weight is good, the mechanics of open and close are smooth and tight. It snaps strongly into place, yet easy to open with just your thumb. The knob on the non-sharp part of the blade makes it easy to flip open with one hand. This is a tiny little knife, actually the perfect size for a pocket knife. Any bigger and it would be burdensome in the pocket, any smaller and it wouldn’t be effective. You can use the clip to keep this pocket knife in your front right pocket, it clipped to your pocket, so the knife is inside and the outer edge of the clip is outside the pocket. This way you’ll always know where it is and it’s easy to fetch when you need it, no fumbling around in the pocket for it. You can carry this along every day, it’ll become part of your daily dress, just like a watch. 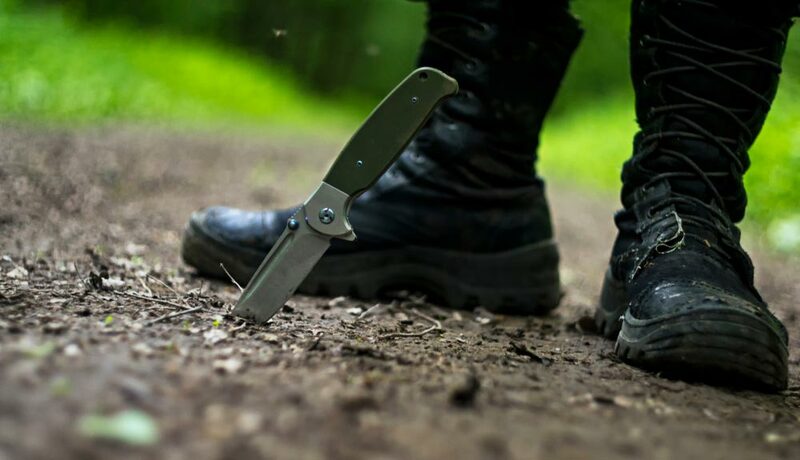 The blade is too small to be an effective defensive weapon, it’s perfect for the handy little pocket knife for all the daily things you need a knife for. If you’re not used to carrying a pocket knife, you’d be surprised how many times it comes in handy. For the prize, it’s absolutely amazing. 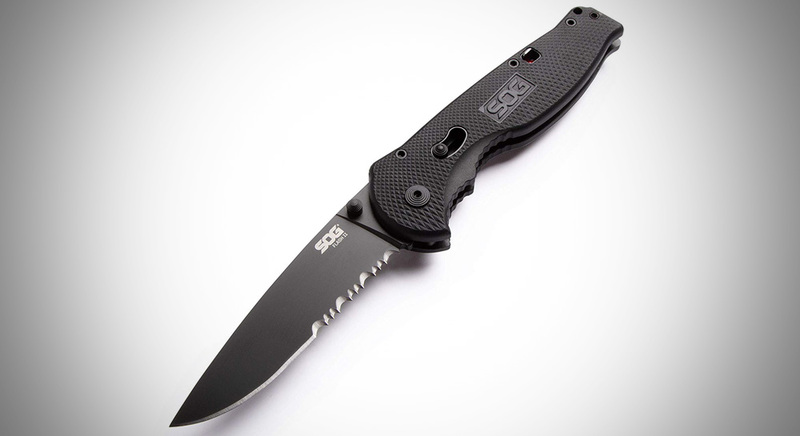 For the price, SOG has made a quality knife. It Fits in your pocket with the clip system perfectly. You’d love how the clip is put on the end of the handle away from the blade so that when you pull it out you don’t have to flip it around again to open it. So many other knives do this and it feels so counter-intuitive and irritating to carry a knife like that. Its spring assisted opening is fast and works great. There is a color-coded lock on the handle that prevents deployment, which is a welcome safety feature on a knife that springs instantly into action. Awesome quality blade. Serrations are razor sharp and will stay despite months and months of use. The handle’s design is very nice and grippy and you’ll love the ergonomic indent design for your two fingers, it feels awesome in your hand. It has an inconspicuous clip design. When it’s sticking out of your pocket it looks like a pen. It’s also a great design because the clip is really far at the end of the handle so almost all of the knife is resting in your pocket. Super sharp, flick open knife. Everything about it feels quality. The body is some type of nylon-glass polymer and feels like something in between plastic and carbon fiber. It’s as sharp as a knife can be and has been extremely useful on a daily basis. You can use it for your everyday tasks either at work, home, camping or just to impress people that are having a really difficult time opening anything with tape. 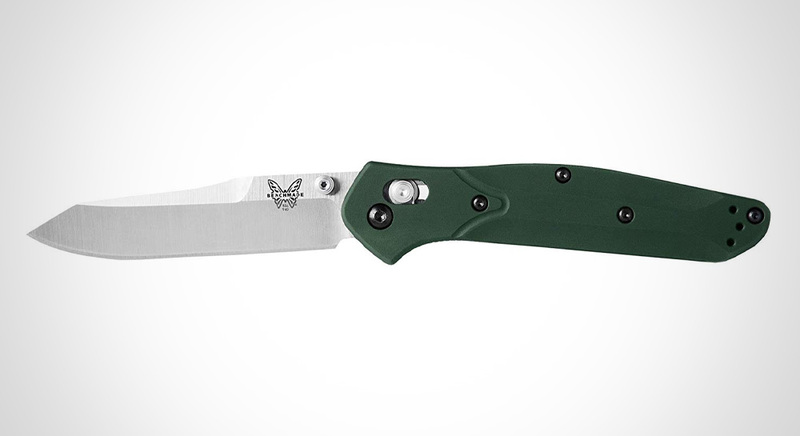 The locking mechanism is ingenious and unique to Benchmade. Works like a dream; it is a simple, elegant solution to locking and unlocking the blade. The handle makes this knife feel incredibly secure in your hand. Also, opening and closing it with tight working gloves is really easy. The pocket clip is on such that the blade points upward and opens into the side of your pants. This prevents the knife from ever opening in your pocket assuming you carry sensibly on the outside edge of your right pocket. Safety first! Spyderco is generally very good at hitting it out of the park, this one is definitely not an exception. They have some refreshing designs and their knives are of high quality, even the imported ones. Lockup is very good. The liner lock is solid and locks regardless of how you open the knife (fast or slow). There is no issue of only half engaging or allowing the blade to work itself loose. Very smooth operation. The blade opens and closes like butter. There is just the right amount of retention on the detent to keep the blade closed, but it is extremely easy to open the blade and even disengage the liner lock and close it one-handed. Lots of options on how to carry the knife: left or right, tip up or tip down. Many folding knives only allow you to change tip orientation. Price to quality ratio is great. Is it better than any $30-$40 pocket knife you might find in the market.?? The answer is: Absolutely. If you’re on the fence about this, please give it a try. The best modern folding pocket knives are a synthesis of outstanding design, quality materials, and thoughtful engineering. they ‘ll be of valuable service whether you are dressing your latest catch, installing insulation in the attic or freeing the occupant of a car that’s been involved in an accident. The best pocket knife for the money differs from person to person due to different factors which we have already discussed above. So we highly recommend you, don’t ever rush into purchasing a pocket knife without first considering all the variables. You can also check our detail guide on best bowie knives. If you’ve any suggestions or we have missed anything, please let us know in the comments. Your opinion is highly valuable to us. 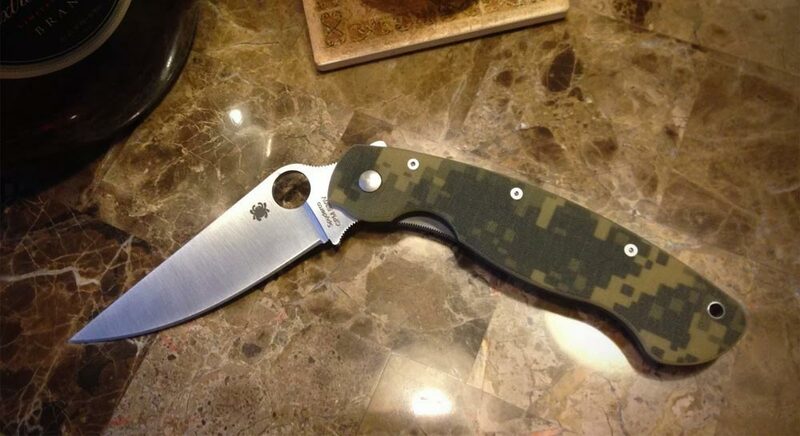 I have own the SOG “Fusion Salute” pocket knife since July of 2013. Doubles as a work knife and EDC. The scalloped full-length steel liners, A big lock back, smooth as silk operation, proven “Bowie” style blade, machine G-10 handles gives an grip. Movable thumb-stud, and a trade-mark low carry clip for easy pocket carry. Purchased for less that $25 6 yrs. ago. Well constructed, durable, and reliable. Excellent EDC knife. Thanks for letting us know about fusion salute, we will update this list after testing fusion salute knife.